Whispers in the Loggia: Blessed John Paul, Pray For Us! 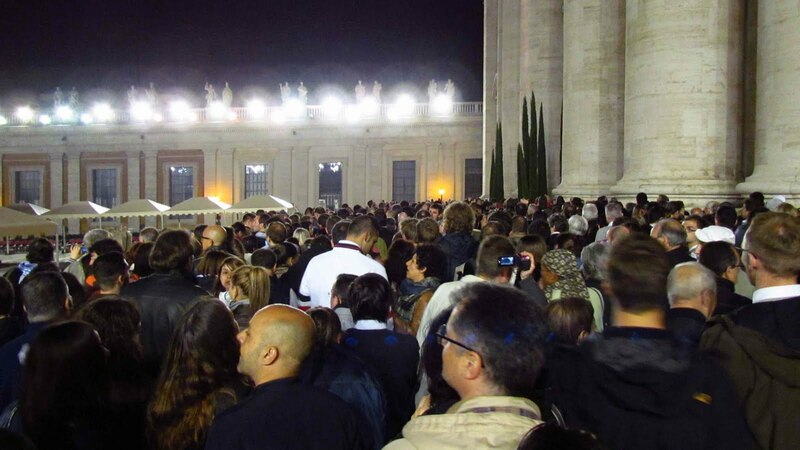 Even in death -- or, for that matter, even in the dead of night -- Blessed John Paul II can still command quite a crowd. 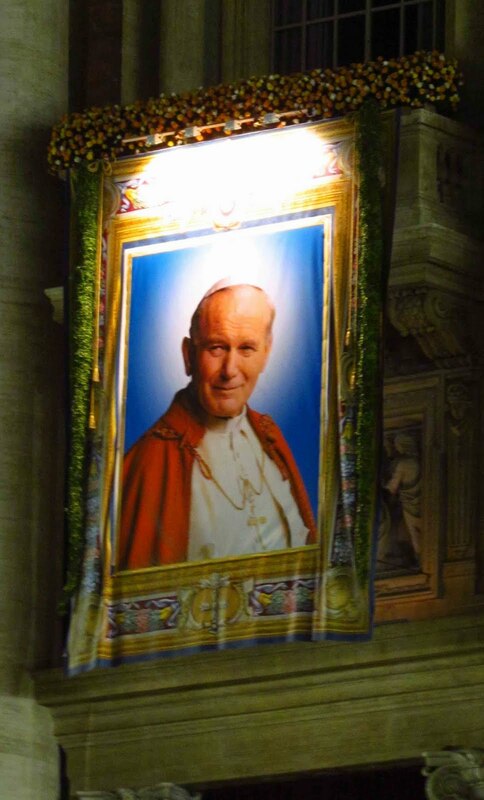 While any doubt of that was arguably obliterated by the million-plus who mostly turned up before dawn for the Beatification Mass itself -- Rome's largest gathering since the late Pope's 2005 funeral -- tens of thousands still overflowed St Peter's Square as dusk fell over the Urb on this "Blessed" Sunday. 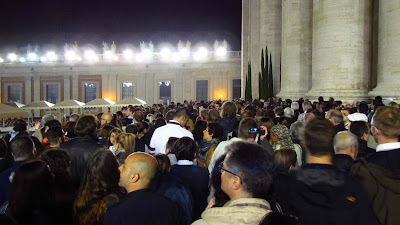 What's more, though, even at 1am Monday local time, it still took well over an hour for the faithful to enter the Vatican basilica, where the newly-elevated pontiff's triple coffin was on hand for public veneration from immediately after the morning Mass. 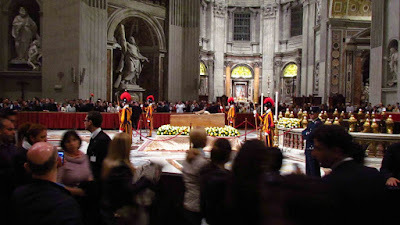 Though some pilgrims seemed more keen to take pictures than anything else, the Sanpietrini who staff the world's largest church were particularly solicitous toward the many who came to pray in the night, scores of whom knelt for long periods on the basilica's well-hardened marble floor, as close as they could get to John Paul's remains. As flag-carrying Poles openly wept and the locals chatted amongst themselves, a group of kneeling African pilgrims sang prayers in French as the crowd wrapped its way around and behind the high altar, most stopping for a quick prayer and/or photo as they passed. 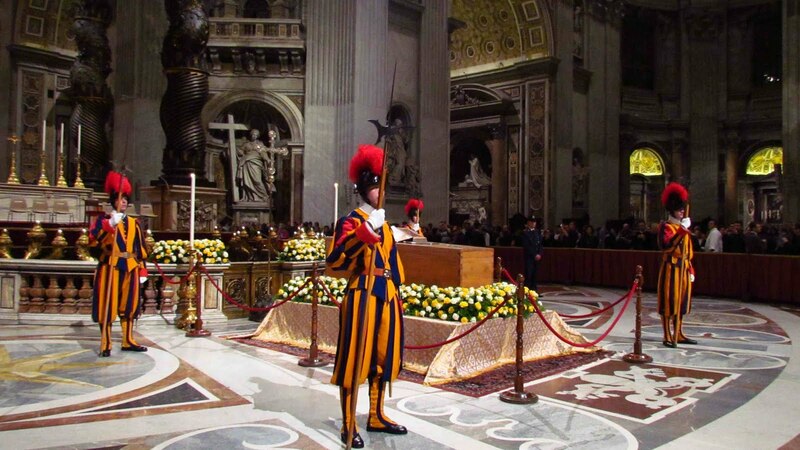 The queue cut off around 1.30, the basilica is set to close at 3am and reopen following the mid-morn Mass of Thanksgiving for the beatification, which'll be celebrated in the Piazza by the Vatican Secretary of State, Cardinal Tarcisio Bertone SDB. Come evening, John Paul will be reinterred in his new tomb -- a marble sarcophagus bearing his name -- in a side-chapel on St Peter's main floor, the spot blockaded off in the meanwhile. The stone that covered the Blessed Pope's prior resting place in the grottoes beneath the basilica is to be sent back to his native Poland, to be displayed at a basilica-in-waiting dedicated to the new Blessed currently being built in Krakow. All that said, as this scribe tends to take what he can get, it was a blessing and gift to have almost an hour at the Beatus' side. As lingering for that long probably wouldnt've been possible earlier in the day, knowing the ways of this town, that's why I waited to go in. To be sure, I had my own prayers and thanks to say... and, well, no shortage of those. But after the ask went out at the weekend's start, many of you likewise shared intentions that you wanted passed on. At the same time, please keep some sweet words up for this end -- just as this Sunday was as long as it was beautiful, the day to come promises to be another whopper... only this time, with your narrator in the hot seat. See, it's one tough thing to moderate a comment box... to attempt the same for the blogosphere gathered in the flesh, though, could well end up being an even more impossible task. Ergo, in the hope of surviving it intact, time to crash. God love you lot forever; after a memorable day, buona notte e buona domenica -- and above all, Blessed John Paul II, pray for us!